The flamenco guitarist Juan Manuel Cañizares has had an outstanding career from a very young age. Performing with legendary flamenco guitarist Paco de Lucía in his sextet, and also in the guitar trio with Paco de Lucía and Paco’s nephew, José María Bandera, he left an indelible impression on us all. 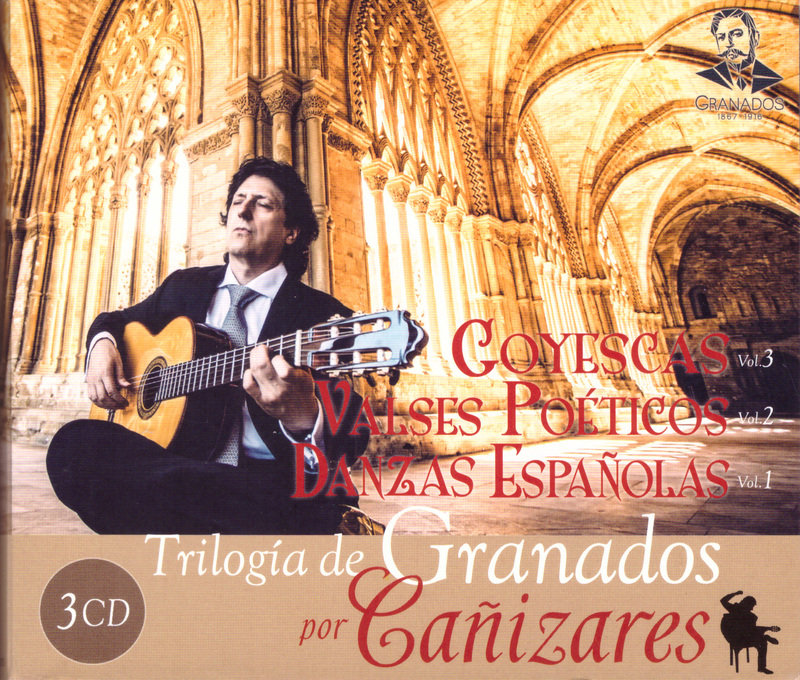 Cañizares is a musically restless soul and for a number of years now, has been arranging and recording what is considered to be ‘classical guitar’ repertoire, that is, the Sonatas of Scarlatti, the music of Manuel de Falla and most recently the music of Enrique Granados – three CD recordings including Danzas Españolas Op. 37, Valses Poéticos, Seis Piezas Sobre Cantos Populares Españolas, Dos Gavotas and Los Majos Enamorados. In all of these recordings, what we note is Cañizares’ level of perfectionism: so particular is he that none of the nuances of his arrangements are lost that he multitracks the recordings when the arrangements are for more than one guitar, as they most often are. The result is nothing short of very special each time – very personal and always engaging – as he offers his perspective on this well-loved repertoire, one which is clearly coming from a deep understanding of the non-classical musical styles that inspired Granados and thus has much to offer. While Juan Manuel Cañizares continues to work in his own flamenco sextet and quartet, he is regularly invited to perform with orchestra. The list from just 2017 gives some idea of the international recognition he has: Tokyo, 13 and 14 January, performing with the NHK Symphony Orchestra Tokyo, conducted by Juanjo Mena; Tampa, St Petersburg and Clearwater, USA, 3, 4 and 5 March, performing with The Florida Orchestra, conducted by Michael Francis; Birmingham, 23 March, performing with City of Birmingham Symphony Orchestra, conducted by Josep Pons; Cordoba, 1 July, performing with Orchestra of Cordoba; Pamplona, 22 August, performing with the Orquesta Sinfónica de Navarra, conducted by José Antonio Montaño; Milan, 31 August and 3 September, performing with Milan Symphony Orchestra Giuseppe Verdi, conducted by José Antonio Montaño; Gävle and Billnäs, Sweden, 28 and 29 September, performing with the Gävle Symphony Orchestra, conducted by Javier Martín; Palma de Mallorca and Ibiza, 26 and 27 October, performing with Orquesta Sinfónica de Baleares, conducted by Joji Hattori. On Saturday 11 November 2017 JUAN MANUEL CAÑIZARES (flamenco guitar), DAVID DEL PUERTO (electric guitar) and IGNACIO RODES (classical guitar) performing with the Orquestra de la Comunitat Valenciana, conducted by JOSEP VICENT will première LEUKANTE – Concierto para Multiguitarras y Orquesta by David del Puerto at the Auditorium ADDA in Alicante, Spain.